Shrimp Egg Sandwich is a strange name and a strange sandwich. I never had this before in any restaurant. I came up with this idea because I was requested to make a shrimp sandwich. Shrimps were all small and not big enough for sandwich. It was difficult to put them between breads without falling out, so I need a banding agent to make all shrimps stay together. Eggs were the perfect choice, plus egg taste go very well with the shrimp. Add few pieces of chicken bacon, and lettuce. The strange sandwich actually tasted great. 1. heat up little bit olive oil, and stir fry shrimps until their color turns into red. 2. add beaten eggs with salt and pepper into the pan. 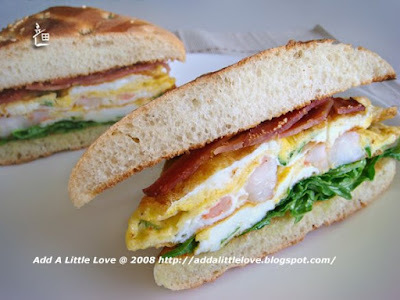 Don't stir egg too much, make sure egg and all the shrimps stay in one piece for the sandwich. 3. Assemble and sandwich with your favorite vegetables or sauces.